This travel pictorial and Japan travel guide captures the sites and soul of Kyoto--Japan's historical and spiritual center. An elaborate kaleidoscope of craft, artistry and religion, Kyoto is one of the world's most popular travel destinations. Art and design form the weft and warp of this vibrant 1,200-year-old city, home to hundreds of gardens, palaces, villas and magnificent wooden temples, including seventeen UNESCO World Heritage sites. Like a Zen koan, Kyoto defies easy description. Its citizens may work at Nintendo designing video games, at a company designing precision medical instruments, or sitting cross-legged meticulously affixing micro-thin flakes of gold foil onto a painting. All of them share a living heritage grounded in centuries of traditional culture. In Kyoto: City of Zen, local Kyoto expert Judith Clancy presents the most important gardens, temples, shrines and palaces of this ancient capital city and enduring cultural center. 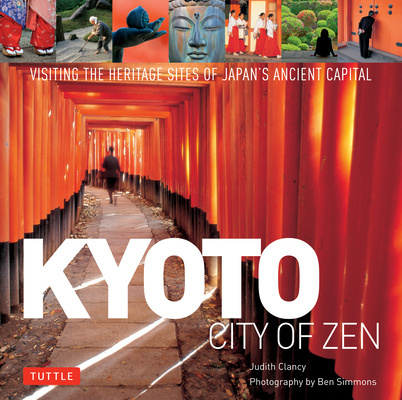 In addition to unveiling the city's spiritual and historical riches, this travel book shares with readers the exquisite foods, artistic crafts, religious ceremonies and architectural traditions that have flourished in Kyoto for over a millennium. Tea ceremonies, calligraphy, weaving, pottery, painting, drama, and many more traditional arts and crafts are presented through more than 350 photographs by Ben Simmons, whose images capture the true essence of Kyoto. The city's natural setting also comes into focus as you walk along leafy mountain paths and through spectacular parks and gardens viewing the best foliage each season has to offer. A resident of Kyoto for over 40 years, Judith Clancy lives in a 120-year-old converted weaver's studio in Nishijin, Kyoto's weaving and dyeing district. She interprets for different groups and teaches about Kyoto's history and culture and is the author of "Exploring Kyoto." Ben Simmons is a longtime Japan resident whose photos have appeared in books, magazines, and exhibitions worldwide, including the Victoria and Albert Museum and the United Nations. He holds an MFA from the University of Florida. Some of his other book projects are Tokyo Megacity and Traditional Japanese Architecture: An Exploration of Elements and Forms, both published by Tuttle.